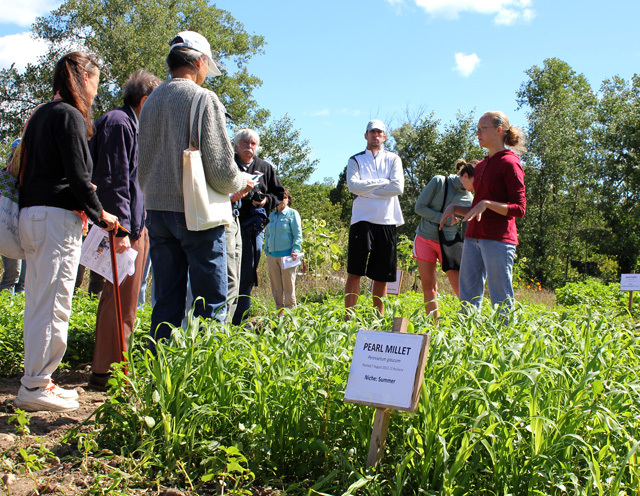 More than 120 people attended the Family Field Day at the organic acres of the Homer C. Thompson Vegetable Research Farm Sunday. Kathryn J. Boor, the Ronald P. Lynch Dean of the College of Agriculture and Life Sciences, welcomed the group, and was followed by sessions focusing on techniques home gardeners (as well as small farmers) can use – such as cover crops, mulches and hand tools to control weeds, seed saving, and trickle irrigation and more – led by Cornell experts and others. There was also lots of yummy food (roasted peppers, fresh fruit, organic chocolate milk) and activities for the whole family, including an up-close view of birds of prey handled by student volunteers working with the Cornell Raptor Program. The Homer C. Thompson Vegetable Research Farm is managed by the Cornell University Agricultural Experiment Station. Horticulture Ph.D. candidate Megan Gregory (right) shows gardeners how to use cover crops to improve soil. Charles Mohler, Department of Crop and Soil Sciences, demonstrated a wide range of weed control tools. 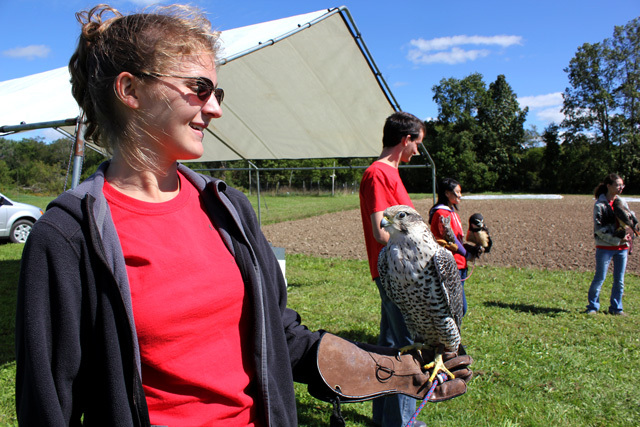 Student volunteers with the Cornell Raptor Program gave attendees an up-close look at birds of prey.